1. What is your age, and how long have you been training with Sean? I’m 47 now, started running at age 39 & have been training with SWEAT Sydney since 2009. 2. Are you an online only client, or do you attend sessions as well? Both, but due to distance, work and family commitments I can’t get along to as many sessions as I would like. 3. What has been your experience in training with Sean as a coach? There are so many positives. Firstly he loves and breathes running and it is extremely contagious. He has created an inclusive group environment where all runners can prosper regardless of their ability or chosen distance. I doubt that there is any other coach in Sydney that caters for such a diverse group of runners ranging from Olympians right down to joggers. He really knows his athletes well, treats them with respect and is always very supportive and encouraging. It’s great fun to come to training and you know that with the depth & strength of the group, that there is always going to be someone around that can really lift you. On a personal level, I’ve always appreciated Sean’s honest feedback in assessing my form. It’s very motivating to go into a race when your coach believes that you can execute a certain plan or pace, even when you are not entirely convinced in your own mind. When I recently ran a 30 second 5000 metre PB, all indications in training suggested I might go okay, but it was Sean’s belief in me that gave me the confidence to go out at a pace that I’ve never attempted before. 4. 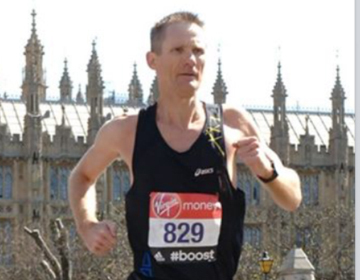 You spent several years chipping away at your marathon PB, getting it down to 2.37. You are now focusing on 5k and 10k. Do you prefer the shorter distances or the marathon, and why? That’s a really tough question. I absolutely love the marathon; it will always be my favourite event. To put it in perspective, I’ve watched every men’s Olympic Marathon since Moscow in 1980. One of my greatest sporting memories as a kid was watching Deek run down pass Ikanga in the 1982 Brisbane Commonwealth Games. In 2008, I ran a marathon in training on the treadmill watching Wanjiru win the Men’s marathon in Beijing (I started well before him and finished after him of course). I see the marathon as the ultimate sporting pursuit. Anyone can run one, but racing one extremely well requires years of good planning, preparation, dedication and sacrifice. Realistically, most people are good for 2, perhaps 3 quality marathon attempts every year. So much goes into just getting into peak physical shape before you line up at the start of a marathon and then you just pray for good conditions (very rare). Then there are the mental elements of critical evaluation and trying to formulate and execute the perfect race strategy for those 2 or 3 attempts. You’re really laying it all on the line. It’s not like you can have another crack in a few weeks if things go wrong. Whilst I love the marathon event, the training that goes into it over many years can be quite relentless at times to say the least. In recent years I really put a considerable level of effort into most long runs. This included intervals totalling 16-25 km’s of marathon paced or slightly quicker running within a 30-32 km long run every other week, and a long run of not less than 35 km’s of moderate paced running on the alternate weeks. My medium long run was typically around 24 km’s at a moderate pace as well. I did 1 pure speed session every week, such as quarters or wind-sprints, and a longer tempo or intervals session on the week that I wasn’t doing a quality long run. Through personal experience and Sean’s coaching, I’ve learned that the most undervalued yet key component to successful racing (especially for older runners) is listening to your body, optimising recovery, remaining injury free and patiently allowing for the adaption that follows. To undertake the marathon training that I was doing I usually needed 2 and sometimes even 3 days of aerobic training between my quality sessions to improve, properly recover and adapt. Whilst this type of training worked extremely well for me, it doesn’t fit the mould of a traditionally structured programme & it usually doesn’t fit in with what others are doing. Add in family & work commitments and it’s an even tougher ask to align with the Sean’s squad sessions, so I often found myself doing the hard sessions solo. It was good for mental toughness but boring at times. Switching to shorter distances has enabled me to take the focus completely off the pace of my long and aerobic runs, take on a more structured approach and undertake more hard sessions (Tuesday, Thursday & Saturday) and yet still get the right level of recovery in. In summary, I’m not really sure just yet which distance I prefer. I just love running and am constantly looking to challenge myself and continually improve. Switching to the shorter distances will hopefully allow me to race more frequently and work on the technical aspects of my running gait and hopefully delay the marathoners shuffle. 5. You infamously took a wrong turn at the Carcoar Cup marathon, whilst leading in 2012. Tell us what happened there, and were you still awarded the victory? I’d nearly forgotten that. Thanks for the reminder. Haha! I’d actually just completed a marathon in Berlin not long before that race and pretty much just rocked up for a weekend away with a number of other runners. I arrived at Carcoar the day before and hadn’t even worked out which race to enter. The idea of actually giving 100% and racing a marathon on that very hilly course certainly didn’t appeal to me but a moderately paced long run seemed like a reasonable plan, so I entered on whim. As for the race itself, from memory I cruised along and after 25 km’s or so found myself in the lead by a few minutes or so. I wasn’t familiar with the course and was simply following the lead car. Being a small country town race, perhaps the driver thought a small detour to check on their livestock or fix a broken fence wouldn’t hurt. By the time the driver worked out that they had gone the wrong way, I’d technically embarked upon my first and only ultra. I eventually ran back to the actual course, having added an extra couple of km’s or so & by that time the new leader was well out of sight. My planned moderately paced long run was adjusted on the spot to a fast finish long run and I just knuckled down and gave 100% over the some pretty fierce hills. I did my best to try and reel champion mountain runner Angela Bateup back in and very nearly did, but in the end she got the honours and I was “chicked”. I was awarded the first male prize but hats off to Angela, her name sits on top of the 2012 honours list. 6. Keith and Heidi Bateman wrote a book ‘Older Yet Faster’. You are only a few years away from age 50. Do you believe that you can continue to get faster? I hope so! So far, so good. The motivation is still there. I’ve set new PB’s every year for the past 9 years and feel like there is still a lot I can work on. In particular technique refinements and more focus on quality speed sessions. Staying injury free will be crucial. 7. Who are you main rivals in the training squad? I don’t see any of the guys as being rivals actually. I love to see them all do well. Over the years Big Jim Dawes is the one who has lifted me the most in training. Lately I’ve been keeping Sean honest, probably on his off days. 8. Who is your favourite runner? It’s hard to call out just one favourite runner. As a kid I was in awe of Rob De Castella & after him I kept an eye on Mona’s career a bit. These days, I’m a massive fan of Yuki Kawauchi. I’ve never seen a face with so much pure determination written all over it. Since joining Sean, I’ve been inspired by and admire so many of the current & former athletes like Benny, Harry, Victoria, Tim, Lara, Fossil, Mo, Big Jim, Wazza, Alex, Seany, Vlad, CT, Greta, Lewis, Kip, Hambo, Fleur, Louise, Mitch & Sandi and the list just goes on. There’s so many promising juniors coming through as well. 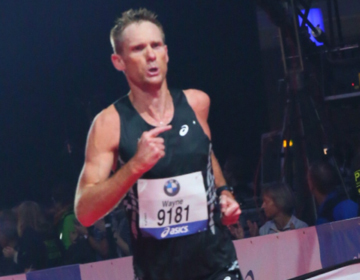 One unsung runner in particular who inspires me, especially as far as longevity & determination goes is my Parramatta Park mate Chris “Oldman” Dwyer. He’s not far off 64, has an extremely healthy Masters running resume dating back 25 years, has probably ran the equivalent of 3 to 4 times around the world (including over 60 marathons and 150 half marathons), is still running 130 km’s pw & pushing marathon times just over 3 hours. 9. Who is your favourite non-running sports person? Whilst I don’t particularly like tennis, I’d have to say Roger Federer for his sheer class, humility and character. I also wish I was old enough to have seen Don Bradman play cricket.